The leaves are usually dark green in summer; however, the size, color and texture of the leaf can vary. The fall color is a greenish-yellow. 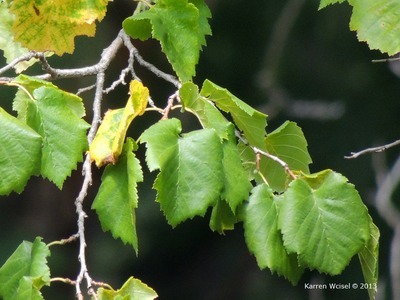 Since this photograph was taken August 1, 2013, the leaf color in this image is most likely related to environmental stress; it is not an example of fall color.